Hello, I rewording my original question that went unanswered some weeks ago since I migrated for the first time. There several configurations I cannot get my head around. I have not been able to get the clock to show me the day date and time. I have played around with clock properties but it has not done it. In Mint I was able to see recent files. But here I cannot find a way of installing that app on the panel. I would like to be able to press my keyboard screenshot button to take a screenshot. Is there a way to enable that in Peppermint.? Finally, is there a way i can disable opacity between overlapping applications? You can click Recent in the left pane of the file manager. Ctrl + Alt + PrtScr to take a screenshot. It's saved to the desktop. PrtSc should already take a full screenshot .. if it doesn't your keyboard must use some weird custom key codes. and recompile the keymaps before the PrtSc key works .. but it works on my other hardware. Do you know how to use xev to get the keycode for your PrtSc key ? Hello Murraymint, please see my reply. 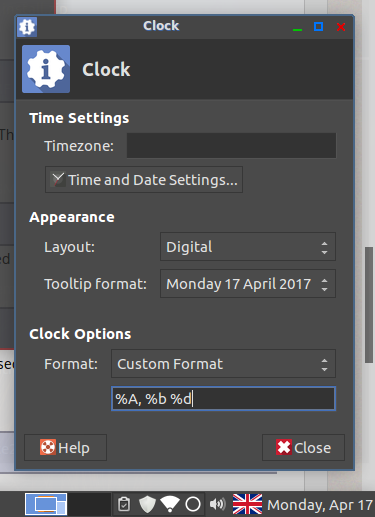 I have been trying to configure the clock to display day name, month name, date, year thus: Monday April 17th. Therefore: %A, %b %d. But this has not worked for some reason. Is there no way I can place recent files under the menu launcher as you would see in the Mint menu as opposed the file manager.? Those key combinations do not work on my keyboard but they have in Mint 18.1. Seeing that Peppermint 7 is based on Mint 18.1 I do not see why I would have to mess with the internal scripts...? Many thanks all for their contributions. Unfortunately not. But I am willing to give it a try if I was presented with some tutorials. as a kind of workaround. Peppermint 7 is not based on Mint 18.1 .. yeah both are based on Ubuntu 16.04, but I have no idea how Mint/Cinnamon handles keymapping or if they've changed anything from the xorg defaults (we have not). This topic is entitled Panel & recent files .. so can you please post the PrtSc issue in a separate topic with a descriptive title and stating the problem from the beginning. b) so topics can be marked (SOLVED) where a solution is found .. again making it easier for future searchers to find a known working solution. Hello PCNetSpec, I got the clock to work according to the desired format. One down and two more to go.